Nvidia Shield TV is one of the best streaming boxes out there – and it looks to have even more tricks up its sleeve than we thought. A commenter on Nvidia's Geoforce forums posted about an apparent split screen feature for the Nvidia Shield, which they activated by hitting CMD + Windows on their plugged-in keyboard. Is Nvidia planning a smart home device? 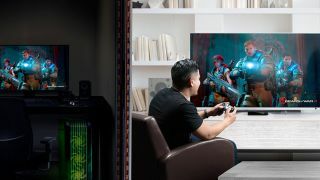 This would allow users to play two apps side by side on their TV or gaming monitor – invaluable for multi-tasking, or playing games with a video tutorial open. What's curious is that the split screen hasn't been advertised as an official feature, suggesting it may be a bug, or something released in an update that hasn't been entirely configured. In the video below from user Thobal you can see the split screen in action, though it only seems to work for apps that can display in portrait mode as well as landscape (in order to fit side by side on the screen). We've reached out to Nvidia for comment. As a dedicated, high-power streaming box for TV, films and games, the Nvidia Shield is one of our top choices – despite the high price point. Streaming boxes are occupying an increasingly curious position though, in a market where the majority of smart TVs come with streaming apps – and often 4K capability – built in. What need then for a separate streaming box? Nvidia Shield offers a unique mid-way point between a dedicated games console and TV streaming device. If you want the former, a PS4 or Xbox One will cost you a fair amount more; if you want the latter, you're not getting the on-board power or dedicated gaming controller. And as the feature here has shown, there's even more going on beneath the surface. Apple TV vs Fire TV Stick vs Roku vs Chromecast: which streaming device is for you?